As busy new parents we’re usually focused on the mechanics of breast or bottle-feeding, then introducing solids: when to start, which foods, in what order, how much and how to provide the best nutrition. But most of us also hope to foster healthy eating behaviors for our children. We want to do all in our power to prevent eating disorders, childhood obesity (an issue of increasing concern), and even the subtler issues some of us struggle with, like the impulse to clean our plates or eat for emotional reasons. We are creatures of habit, and the first years in our child’s life are by far the easiest time to establish healthy ones. Here are some feeding suggestions advised by infant specialist Magda Gerber that help establish positive eating behaviors. Relax and enjoy breast or bottle feedings. Make eating a focused, intimate, stress-free time together. Babies are refueled by the loving attention they get while nursing or bottle-feeding to then enjoy time playing independently. They learn that eating is a time to be mentally present, rather than being taught to ignore the experience by a distracted parent. Most importantly, our baby feels respected and valued when she is asked to actively participate in a feeding experience with us, rather than just being fed. I recently read a comment from a mother who didn’t believe she should pay attention to her son while he breastfed because whenever she talked to him he stopped nursing. All I could think was — what a polite boy to stop sucking to listen to what his mom was saying! It sounded to me like he was trying his best to engage. Tune in, and take care to not overfeed. Paying attention to our baby during feedings also helps develop her internal cues to signal fullness. A study reported in Science Daily concluded that “tuning in” comes more easily when we breastfeed because, according to researcher Katherine F. Isselmann, M.P.H., “…with breast-feeding, the ability to measure in ounces how much a baby has eaten isn’t there, so mothers can become more in tune with when their babies are done eating and babies are able to develop their own internal cues to signal when they feel full.” The study compared preschool-aged children who had been breastfed with those who had been bottle fed with pumped breast milk and found that breastfed children could more easily determine when they were full and had a lower body mass index (BMI) than those fed by bottle. If we bottle-feed, we must make a concerted effort to tune in to our baby’s signals and be less focused on the ounces in the bottle. Be careful with comfort food. Nursing a baby when she cries for reasons other than hunger, rewarding or soothing children with food can create dependencies. Ideally, these are exceptions, not the rule. We are always teaching our children, and the safest lesson for our babies to learn about food is to drink when thirsty, eat when hungry. Small portions and no “one more bites”. When introducing solids, Magda Gerber suggested placing a very small amount of food in the baby’s dish (with a larger bowl nearby), so that rather than feel overwhelmed by too much food, the baby has the opportunity to signal for ‘more’. We want to trust our babies to be “in charge” of their appetites, to indicate a desire for food by opening their mouths when we present them with a bite or spoonful. “Just one more bite” coaxing can turn feeding into something our babies do to please us, encourage overeating, or make eating a power struggle. To give babies even more opportunity for active participation when they eat, offer the baby an extra spoon so she can practice. But when practicing becomes “playing with food”, gently discourage it. If solids are introduced before a baby is able to sit well and autonomously – meaning not propped or positioned, but able to attain a sitting position easily, entirely on their own – the baby is fed while reclining in the parent’s arms on the parent’s lap at the table. My husband and I wore an apron when we enjoyed these feeding adventures with our babies. Then, when the baby sits easily and independently, you can transition to a small table (like breakfast-in-bed tray with legs, wooden footstool with a level top, one of the wonderful kidney-shaped tables we use in RIE parenting classes, or something you or your talented carpenter husband can make). The baby sits on the floor, then later on a small stool or chair, while you sit across the table from her. No ‘squat-and-gobble’. Sit down while eating, wherever and whenever. Sitting down while eating, even if it’s just for snacks on a patch of grass in the park, helps prevent choking accidents and encourages relaxed, attentive eating. It’s also good manners, especially when visiting the homes of others (who might not welcome a trail of cracker crumbs). Asking a baby to sit when he eats is a sensible first behavior boundary. Don’t let your toddler trick you into following him around with food in your hand. When infants and toddlers are hungry, they are absolutely capable of sitting down if we are consistent and clear about expecting it. Eating while playing, playing while eating. Help your child learn to keep activities separate to help delineate meals and snacks as times to focus on food. Asking a child to sit (rather than climb monkey bars) while he eats is one way — keeping toys away from the table is another. Ask your toddler to please put his toy down until he is finished eating. Babies, especially when they become toddlers, don’t always eat the way we expect them to, and it’s easy to become anxious if our child doesn’t seem to be eating enough, especially if he isn’t gaining weight normally. Of course we must check in regularly with our baby’s doctor, explore possible allergies, illnesses or digestive issues. But try to be calm during baby’s mealtimes. He senses our tension and it can make eating more difficult for him in the short term, and possibly contribute to problems down the road. We know we should walk the walk, but darn, we like to eat while we’re standing up and running around. This is yet another instance when our babies make us better. Only our babies can know their own appetite. So, our goal might be to encourage them to stay attuned, to keep listening, and trusting their tummies. And if we establish healthy eating behaviors in these formative first years…we can all fudge later. Thank you for such and insightful article. 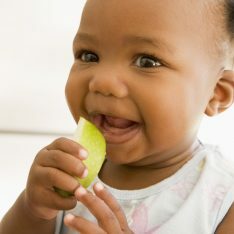 I am starting to give solids to my little boy and this article is very informative. 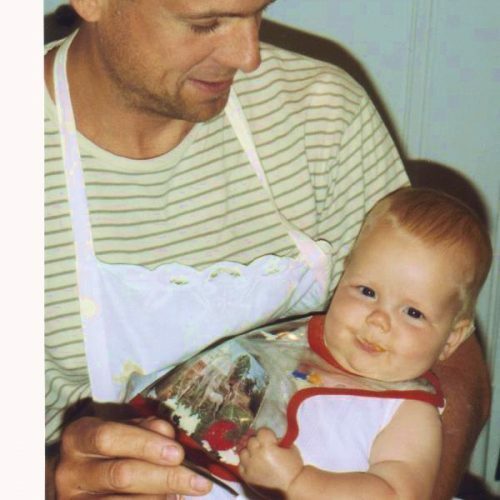 I also recall that as a baby my parents did feed me by holding me and not putting me on a high chair. It is very loving, I still remember! Many good recommendations (in bold), Janet. I think high-chairs are fine but sitting on small close-to-the-floor furniture is okay and far better than sitting directly on the floor without a table surface. Agreeing that supporting baby’s feet is best. This has mostly to do with my opinions on how the infant spine develops – sitting on a surface/chair over on the floor. Setting-up the freedom to ‘fudge’ is a good thing! Hi Janet – Great article. Very timely – thinking about the next stage of food for Eliana (currently almost 8 months). We have been using the breakfast tray from Bed Bath and Beyond with a little mat for her to sit on. It is amazing how she has really responded to the boundary “please sit down to eat.” Constantly blown away by the RIE approach’s effectiveness. Wanted to share and hear your thoughts – while checking the internet for the safety of introducing cooked onion and garlic (in chicken soup), I was delighted by some discoveries: 1. spices are encouraged (not hot, but interesting flavors) and 2. there is a “new” approach called Baby-led-weaning from the http://www.homemade-baby-food-recipes.com website. This approach encourages the feeder to place chunks of soft food in front of baby (as oppose to puree) and allow baby to feed him or herself. It felt very much like Magda’s approach. What are your thoughts? I did this (although I didn’t call it “baby-led-weaning”) with my third child. He was fed exclusively with breast milk until he was almost a year old. We were in no hurry to add the complication of solids to our life, and our doctor at that time encouraged waiting until babies were 9-12 months old. The most important way to feed is with lots of communication and responsiveness, and to be patient and tuned-in. Alexandra, thanks! I really appreciate you sharing this. You know I am on the same page about this- it is one of my passions and a CONSTANT battle, not so much with the children but with other carers who still insist on using food as an emotional tool. Let’s get the word out! Thank you for a great post. As someone who studies obesity for a living, and who cares very much about the health (and nutrition) of her own family, I couldn’t agree with you (and your/Magda’s/RIE’s) recommendations more. Children know when they are hungry and when they are full- they are very attuned to that. Learning to trust your child’s skill in this area can be difficult, but is one of the most important things we can do for our kids (I think). Too many children have this capability overridden by well intentioned caregivers. I also agree that leading by example is important in establishing life-long healthy patterns. Children do as they see, not as they are told. It often takes several introductions with a new food before a child is really ready to try it, and sometimes before they begin to identify if they like it or not. I am a huge proponent of offering, offering again, and then offering again. No hiding that broccoli under a pile of cheese- prepare fresh foods that highlight their natural flavor and be patient! PS- When will there be some RIE training courses on the East Coast?! Hi Kiyah! Interesting to know that you study obesity. I just read something crazy in the paper last night… Almost one in two children are overweight? Is this true? I would love to hear more about your findings on all this. It is such an important subject! And I’ll check to see if there are any RIE trainings planned for the East Coast soon. You will love the RIE Foundations course! I believe that one other benefit for slowing down and staying present with children is that we start to notice their cycles. In my work with children I have observed that different types of growth cycles tend to yield different cravings. It seems that when children are having a BIG neurological growth spurt they tend to crave more carbs, fruits and veggies. When they are getting ready for a bit physical growth spurt then proteins seem to be on demand. I have no science to back that up…but I have seen it over and over again. And I truly believe that when we slow down and listen, they slow down and listen, and then we can both know what they need most. I have so much gratitude for you sharing this work and your passion on this Blog! I am just starting to read about RIE and all of its wonderful benefits! I have an almost one year old daughter who is still breastfed and who I plan to continue to breastfeed until she is 2. My questions are in regards to nursing for comfort. The way I see it nursing is all about safety and comfort as well as nutrition. If a child is asking to nurse after feeling sad, being in pain from teething etc…why is it bad to let that happen? I’m new at this, but the RIE approach seems to be about respecting our children’s needs- for my daughter a lot of times that means nursing, sometimes for comfort! I would really love your thoughts on this! Don’t know what RIE says about this, but from 3.5 years of nursing relationship with my son I noticed that nursing for comfort does seem to go away with age occasionally making a comeback for something really really upsetting. Also I noticed that he does differentiate between nursing and “actual” food. Other moms I know who nursed into toddlerhood have noticed this too. So personally I disagree with connection between emotional eating and nursing. Nursing from source anyways. If it’s from bottle it might be different. Evs, when we nurse for comfort, there are usually feelings not being expressed. This doesn’t mean that children will continue to want to nurse for comfort, or even eat or drink for comfort, but it does mean that they have not learned to process all their feelings in a healthy manner. Great article, Janet. 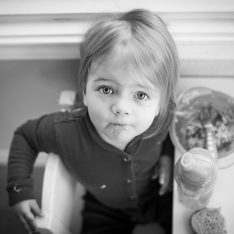 Too often I see parents coax more food into their toddler’s mouths by any means necessary…usually giving them sugar food they can’t help but want to eat. I have also seen a lot insist their child sit in the high chair even when done eating “because the adults are still eating.” I always felt that was an unreasonable expectation for a toddler. I am determined to do things differently. We use a small table for our 9 mo old and end the meal when she signals. Sometimes she’ll eat for 20-30 mins and others its 2 minutes and she’s done. I hope this respectful approach will help me avoid meal time struggles I see other parents struggle with. I so wish I had come across this post when my son was a baby. He seems such a polite, easy but focused and determined child in every other aspect. I had no troubles with sleep, or weaning or diaper change, bath …. any other issue except food. He was such a happy, healthy child when nursing but as soon as I introduced solids at around 8 months (don’t know why I waited so long!) he became a poor eater. I guess because I was concentrating on getting him to finish. In any case, he hated most flavours. I had to employ every distraction tactic to feed him. It was exhausting. He is 4 and still a poor eater 🙁 Well, he is not a picky eater anymore (he really eats healthy by choice) just a really slow eater who only eats well if spoon fed. Otherwise he takes as much as an hour to finish his meal. He wants to finish it, but keeps talking and forgets taking the next bite. We gently remind him but it is just the same for the after 2 bites of concentration. And once everyone else finishes, he is too bored to continue, so will either refuse and be hungry again an hour later or will start crying in frustration. Any thoughts? This is a wonderful article and very good information to keep in mind while my husband and I raise our first child. I have a couple of questions. My son has some medical problems and will be undergoing a few surgeries in the next year on his heart and colon. Feeding has been a very frustrating and complicated experience for my family since there is a lot of stress around how much he eats and him putting on enough weight. We want him to thrive and up to this point that has meant “gain weight.” At some point I know this definition will change for us, but it is hard to implement the very logical practice of respectful parenting when it comes to feeding when we are constantly told by doctors he must eat a certain amount of calories/volume per feeding. I fear that the emphasis on his eating habits and our constant encouragement to eat as much as he can stand will ultimately lead to unhealthy patterns as he grows up. Any suggestions on how we can still implement respectful parenting practices while still keeping in mind his medical/nutritional needs? Your insight would be much appreciated! Love this article. Thanks Janet for making it clear. We have always allowed our kids to choose what and how much to eat. My almost 4 year old makes her own plate for meals. However my 2 year old was losing weight and refusing all solids. We found an underlying chronic disease which was causing pain and food refusal. How do you respectively encourage a I’ll child to eat since gaining weight will help prognosis with the disease? It’s easy to say not to worry and very different when eating becomes more necessary. Janet, my 3 year old nephew and his mother recently came to stay with us. When they arrived she would feed whatever he wanted at any time of the day even if he only took two bites which resulted in them going through all our food within a matter of a few days. First we tried limiting it to 3 “meals” a day in which he would at least have to sit at the table until everyone was done even if he didn’t want to eat and if he didn’t eat at least a little bit then we would limit his snacks. This worked for a few days until it seemed that he didn’t care whether or not he got to eat in between meals and just wanted to get up from the table immediately, spending the entire meal constantly asking everyone if they were “done yet”. He would also request certain items of food but then not eat them when we gave it to him so we started a new rule that if he asked for it then he needed to at least finish that. Again the first few times it worked but then he would take a bite and gag several times and keep food in his mouth while sitting at the table not wanting to eat but when we said “if you want to get up you have to swallow what’s in your mouth” he would do it without any issue and walk away smiling. Do you have any tips for this kind of situation? We had no idea how to handle it and it was clear that he didn’t have strong boundaries before visiting us. Thank you for the many rich resources you provide for stressed out parents! I came back to this article today after my tearful two and a half year old told me that “pancakes will make me happy”.. and I quietly freaked out. Early on I read Elevating Childcare (amongst many others, but it was a stand-out!) and I always did my best to promote mindful eating. We are a family with a prominent food culture, and my daughter always seemed to embrace it: the rituals, the variation, new experiences, the socializing. We introduced her to food according to GAPS and baby-led methods, and she is also still breastfed. I have tried to model mindful eating practices and even before she was born I made a commitment to not using my phone, or even reading a book while breastfeeding. I also tried to always to acknowledge her feelings and not dismiss or shush them, and then comfort her with words and cuddles before she fed. I guess I tried so hard, and now, before even three years of age, she associates food and comfort. What can I do? Am I overreacting? Hi Janet, my daughter is 2.5 years now and we are still spoonfeeding her. She’s a fussy eater and there’s a lot of food she does not like.. so I always try to feed her hoping she would eat more. But it’s becoming a struggle every time we dine out now. She wants a phone to watch when she’s beginning fed, and once she’s bored she wants to get out of her chair and leaves. More confident after reading your article. I had a moment of pause with the wording ‘nursing…when she cries for reasons other than hunger’ because cries for hunger mean that first cues for hunger were missed. So just like following cues for being done we need to follow cues for hunger (ie rooting, turning toward the breast, opening mouth & mouthing, etc.). Perhaps you misread this as “only nurse when your baby cries”? It’s obviously ideal to read more subtle cues in regard to hunger, tiredness, overstimulation, etc. As a pediatric feeding therapist with 20+ years of experience, there are some interesting points here. But this is someone’s opinion and how they raised their children. It is not based on scientific research. Feeding involves all 7 body systems to work at once, it is a very complex process. Every child is different. There is significant variability in a child’s oral motor and oral sensory skills , gross motor, fine motor, gastro-intestinal, muscular, respiratory, cardiac, social-emotional and cognitive systems – all impacting feeding. If you have concerns about your child’s feeding and swallowing skills, please talk to your pediatrician.